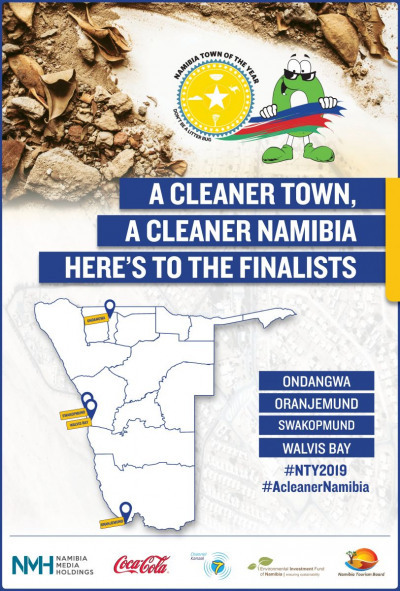 Ondangwa, Oranjemund, Swakopmund and Walvis Bay are the four finalists out of 21 towns in the competition to become ‘Cleaner Towns of the Year’, launched in July last year. Detailed assessments on the towns’ waste management and recycling programmes formed part of questionnaires which town completed. With the 2019 Namibia Town of the Year competition, Namibia Media Holdings has taken the initiative of promoting cleanliness in towns by engaging them to “work towards a cleaner town in Namibia”. This will be an ongoing project for three years, with assessments to be done annually. This initiative is not only aimed at encouraging the continuous efforts to clean up our towns, but also seeks to instil a set of values that will encourage citizens to take pride in their towns. The competition, which is linked to the Namibia Tourism Expo, encourages the participating towns around the need for keeping their towns clean and making them pleasant for tourists and residents alike. NMH believes this initiative will support government efforts in providing a cleaner Namibia. “The Environmental Investment Fund of Namibia continues to be government’s delivery vehicle on a number of initiatives for the successful implementation of the National Solid Waste Management Strategy adopted by cabinet in 2017. We chose to get involved with NMH’s Cleaner Town of the Year competition as it creates the perfect platform for especially small towns to compete and create benchmarks for good environmental practice,” says Lazarus Nafidi, head of communication at the fund. “A community working together for the common good not only improves the attractiveness of the town for tourism development, it also builds better relationships among all involved,” says Albe Botha, NMH CEO. “We are happy to be part of this national project which is aimed at promoting a cleaner Namibia. As the body responsible for marketing Namibia to the world, including to Namibians themselves, it gives us a sense of pride that our visitors look forward to coming back to Namibia, for it is uniqueness, safety and cleanliness. We look forward to a journey with the four finalists, which will not only end with the Namibia Tourism Expo, but looks at the bigger picture of ensuring that they reach greater heights in terms of marketing their respective towns as most sought-after, when visiting Namibia,” says Digu //Naobeb, NTB CEO. The project is supported by Namibia Media Holdings, Namibia Tourism Board and Environmental Investment Fund of Namibia.